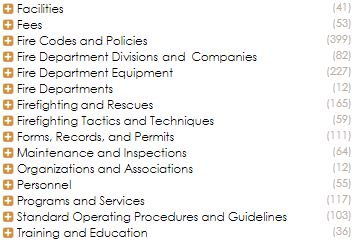 This month we reviewed and updated the WAND Facilities Management Taxonomy. New terms have been added throughout this comprehensive taxonomy. 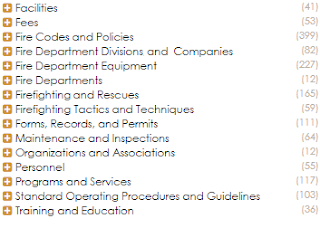 The WAND Facilities Management Taxonomy has 759 categories and 374 synonyms relating to all areas of Facilities Management including Management and Services, Sustainability Management, and Facilitiy Inspections and Testing. Maintenance and Repairs now includes the area of Custodial Services, along with Maintenance Requests, Landscape and Grounds Maintenance, Emergency Maintenance and Repairs, and more. There are also terms relating to Safety and Security Management, Policies and Procedures, Documents, and Facility Billing and Rates. 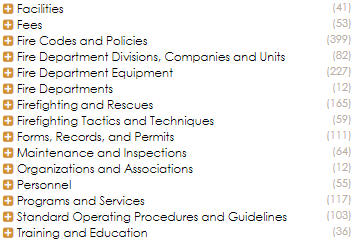 The WAND Facilities Management Taxonomy provides a strong foundation of terms and can be customized to include additional terms related to a specific type of facility. 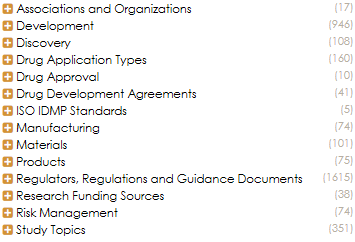 We have just updated the WAND Drug Development and Manufacturing Taxonomy. This taxonomy now has 3,629 terms with 2,311 synonyms covering Drug Discovery, Development, Approval, and much more. It can be customized to include terms specific to the drugs that are currently being, or have been, developed. The development of a new drug is a process that takes a considerable amount of time. It includes the preclinical and clinical trials process, and obtaining regulatory approval. The average time develop a drug is 12 years. Then the manufacturing process begins. The WAND Drug Development and Manufacturing Taxonomy Taxonomy is specifically designed to provide anyone involved in the development and manufacturing of new medicines the ability to tag and organize the enormous number of documents generated during these processes. 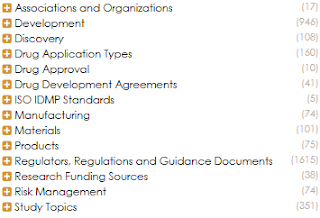 Higher level terms include Discovery, Development, Drug Application Types, Drug Approval, Drug Development Agreements, Research Funding Sources, and Regulators, Regulations and Guidance Documents. The taxonomy also includes the topics of Preclinical Development, Clinical Development, all phases of the Clinical Trials, Pharmacogenomics, Pharmacovigilance, Pharmacokinetics, and Pharmacodynamics. Use the WAND Drug Development and Manufacturing Taxonomy to better organize data and content as you navigate the path of indentifying, developing, and manufacturing a safe and effective new drug. The companion taxonomies are the WAND Manufacturing Taxonomy - an overarching taxonomy - and the WAND Packaging Taxonomy. We started Swagiggle to show the power of well organized product data and how we can use our own tools to make it happen. 1) An eCommerce taxonomy category hierarchy, attributes and specification templates editor that lets retailers create their own custom category structure into which they would like to categorize their products. For each product category, a specification, or attribute, template can be defined detailing the metadata that should be collected on items placed in this category. 3) Product information Management Capability which allows our clients to manage and enrich their product data including categorizing the products to the custom taxonomy that has been created in the tool. Specifications can be assigned to specific products and other metadata fields like descriptions and pricing can be managed in the tool. The WAND PIM helps clients by leveraging the taxonomy created to automatically suggest product categories and attributes for individual SKUs based upon the description provided. WAND decided to become our own customer and we are using the WAND eCommerce Taxonomy Portal and PIM to create a brand new comparison shopping search engine called Swagiggle.com. Swagiggle is now in beta release and you can play with it! We have taken more than 225,000 products across dozens of online retailers and placed them into a detailed eCommerce taxonomy with more than 2,000 categories. 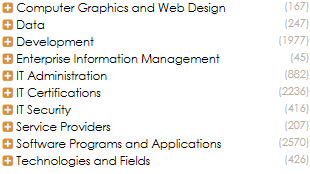 We think our categorization is second to none in its depth and specificity. We'll be adding new products and new categories all the time. Next on our to-do list is to begin assigning attributes to the individual products in our categories so that users can easily filter to the product they'd like to buy based on brand, color, size, and more. We'll be posting more updates and details as we add new features to Swagiggle and to our eCommerce Taxonomy Portal and PIM. If you'd like to explore how to use the WAND eCommerce Taxonomy Portal and PIM to organize your product data - give us a shout. Our latest taxonomy is the WAND State Government Agency Taxonomy. Just as every state is unique, so too are their state agencies. They all have varying types of documents with their own terminologies. That makes this taxonomy a little different. It's designed to provide a higher level framework for a state agency and allows the agency to expand the taxonomy to fit their specific needs. The WAND State Government Agency Taxonomy contains 82 preferred terms and 16 synonyms. Top level areas include Boards and Commissions, Forms and Templates, and Processes and Procedures. Other areas to be expanded include Communication and Engagement, Compliance and Enforcement, Events, Financial Assistance, Information and Resources, Licensing and Permits, Regulatory Documents, Regulatory Process, and Rules and Regulations. The WAND State Government Agency Taxonomy is the perfect starting point to create a unique taxonomy to fit a state agency's requirements. As with all WAND Taxonomies, the WAND State Government Agency Taxonomy is available by itself or as part of the WAND Taxonomy Library Portal. The WAND Aerospace Engineering Taxonomy has been expanded. It provides over 5,470 terms and 874 synonyms and can be customized to include specific terms to meet the document management needs of any company involved in aerospace engineering. 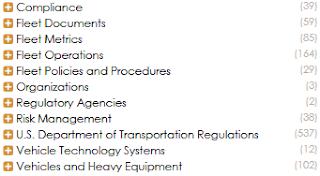 Top level terms include Aerospace Engineering Disciplines, Aerospace Vehicles, Design, Aerospace Materials, Maintenance, Documentation, Research and Development, and Standards. 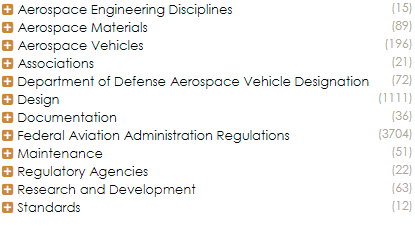 Also included are Regulatory Agencies, Associations, Federal Aviation Administration Regulations, and Department of Defense Aerospace Vehicle Designations. Within Aerospace Vehicles are the areas of Aircraft, Rockets and Missiles, and Spacecraft. Design covers Aircraft Design, Spacecraft Design, Design Constraints, Design Requirements, Design Review, Safety Design, and Systems Design. The WAND Aerospace Engineering Taxonomy provides a strong foundation for any enterprise that needs to tag and organize documents relating to Aerospace Engineering. Companions to this taxonomy are the WAND Manufacturing Taxonomy and the WAND Engineering Taxonomy. As with all WAND Taxonomies, the WAND Aerospace Engineering Taxonomy is available by itself or as part of the WAND Taxonomy Library Portal. WAND Building and Construction Management Taxonomy Update! The WAND Building and Construction Management Taxonomy has undergone an extensive review and update. This taxonomy is designed specifically to tag and organize all types of documents associated with a construction project and is ideal for any construction management company. In this revision, Building and Construction Agreements has been expanded and now includes Contract Clauses and Provisions specific to the building and construction domain. Contracts was also refined by project type. The top level term of Testing and Inspections nearly doubled in size and now includes Methods and Tests for specific building elements. Land Assembly now includes new Zoning and Land Planning concepts. Construction Management now features a section on Construction Claims and other legal liabilities. Terminology relevant to the construction design phase was expanded to include drawing types, proper sheet numbering, and the official plan review process. Building codes were updated and expanded with the addition of Codes and Standards Authorities as well as Enforcement Agencies. Codes and Permits were broken down by project element, work type, and type of occupancy. The updated WAND Building and Construction Management Taxonomy now has 3,928 terms and nearly 3,000 synonyms. The WAND Building and Construction Management Taxonomy is available as a standalone taxonomy or as part of the WAND Taxonomy Library Portal. We have just updated the WAND Banking Taxonomy. 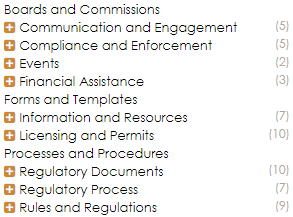 This taxonomy now has 1,663 terms with 1,573 synonyms covering Banking Processes, Regulations, Lines of Business, Fees, Banking Documents, and much more. The financial services industry has been quite proactive in adopting taxonomies due to complex compliance and retention requirements. WAND originally created this taxonomy leveraging experience in helping create taxonomies for dozens of credit unions and financial institutions. We took this knowledge as a base and built on it to create a taxonomy that is a strong starter set for any commercial and retail banking institution. The WAND Banking Taxonomy was specifically designed to help banks tag and organize their unstructured information with relevant, industry specific concepts, processes, subjects, and document types. With the update, Banking Documents now holds narrower terms for Bank Customer Documents as well as Internal Bank Documents. Bank Legislation and Regulations was also expanded - all Central Banks were added by region and there is a new section for International Banking Regulations and Regulatory Governing Bodies. 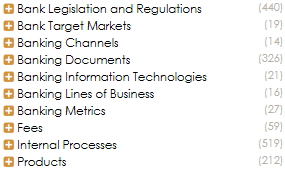 Also expanded were the categories of Banking Metrics and Risk Management. The WAND Banking Taxonomy can be customized to include specific terms to meet the needs of any Investment Firm. As with all WAND Taxonomies, the WAND Banking Taxonomy is available by itself or as part of the WAND Taxonomy Library Portal. We recently updated our WAND Finance and Investment Taxonomy. In this revision we have added a branch for Investment Research Events as a narrower term to Analysis Benchmarks, Tools, and Techniques. This branch is designed to include news events, announcements, or other similar concepts that would be of interest to a financial analyst. It would also potentially be useful for somebody monitoring financial news. You will still find terms relating to Investment Banking Services and to Front Office, Middle Office and Back Office Services. There is also a section of Financial Instrument Design Features as well as a section of Finance and Investment Documents. 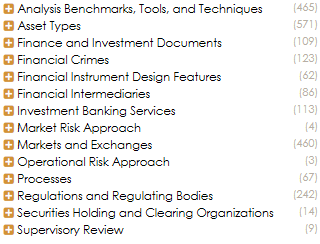 Financial Crimes, Regulations and Regulating Bodies, and Securities Holding and Clearing Organizations continue to be top level terms in this taxonomy. This taxonomy now has 2,342 terms and 1,585 synonyms.